Ten Ren's Whole-Leaf tea bag series offers tea bag enjoyment in a whole new way. Whole-Leaf tea bags are manufactured with a special new machine that allows the whole tea leaf, as found in our loose tea products, to be placed into a tea bag instead of having to cut the tea leaves into a smaller size. Certain tea connoisseurs believe that whole tea leaves are one of the best ways to enjoy tea. 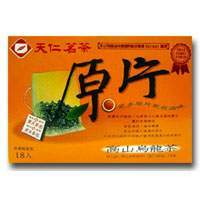 High Mountain Whole-Leaf Oolong tea is a semi-fermented tea with curly, dark green leaves. When brewed, it has a golden hue, a mild pleasant taste, a natural aroma, and a lasting aftertaste. Oolong tea is most commonly enjoyed in Taiwan and southern China, and is the tea of choice in many Chinese restaurants.